Pros: The setting of Regent’s Park at the sunset hour provided a unique representation of the changing mood of the plot. Cons: It gets very cold so blankets and jackets ensue! This production opens our eyes to the unique tools that theatre has at its disposal to bring stories closer to the audience. 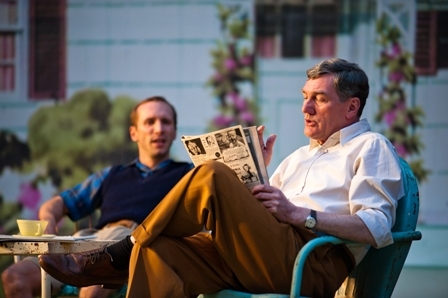 All My Sons is an outstanding piece of naturalistic drama by the American playwriting icon Arthur Miller. Currently running at Regent’s Park Open Air Theatre it has been masterfully recreated under the auspices of Artistic Director Timothy Sheader. The plot gravitates around the Keller family on a warm, American summer day in 1946. The youngest son, Chris (Charles Aitken), has invited childhood friend Annie (Amy Nuttall) to spend some time in the family residence, with the secret intention of asking her to marry him. We immediately discover that Annie was in fact the love interest of another member of the Keller family, the eldest son Larry, who was lost in combat during the war. Chris, however, returned home a hero. Kate Keller (the mother, played by Bríd Brennan) refuses to accept the death of her eldest son Larry, which makes it difficult for Chris to pursue his plan. However, he is determined to put the memory of his brother to rest once and for all and marry Annie, even if it means leaving the house and family business. The plot thickens when we are introduced to the shady relationship between Chris’ father Joe Keller (Tom Mannion), and Annie’s father, who is serving time for a wartime business deal that fell apart under Joe’s supervision, with catastrophic consequences. Initially, Nuttall and Aitken play the 1940’s stereotype of a shy, inexperienced couple. Tom Mannion as Joe is the good-natured parental figure, down to earth and practical. As the plot advances, we realize we don’t know these characters at all and learn of the secrets they are hiding. Each character has a secret of their own, which once revealed changes our perception of them completely. Overall, the roles that really stood out for me were Kate and Chris. Kate knows everything about her husband and son, but must still find a way to love them whilst maintaining control of her mental sanity. Bríd Brennan delivers an outstanding mother figure, one that every audience member will love. Aitken’s character Chris is the still point in the whirlwind: knowing exactly who he has become after the war, he is at odds with the reality of the home life he returns to. Looking back, the one thing missing for me was the tempestuous climax that needed to be portrayed once all family secrets were out in the open. The staging is extremely original: we start the show in the inner circle of Regent’s Park on a lovely spring afternoon to the sound of birds chirping away, and the view of trees all around. The stage is placed over a hive of hanging roots that merge with this surrounding forest, and on it the happy Keller family sit on their elegant porch. They look as carefree as the family in the massive American Dream poster-wall which serves as a backdrop. As the play progresses and the sunny disposition of the characters gives way to their darker selves, night falls around us. The temperature drops and everything goes quiet, almost as if the emotions on stage have taken over the surroundings. I would even go as far as to classify this experience as one similar to immersive theatre. Ghostly apparitions and the occasional elephant from the zoo trumpeting in the distance do nothing to help the increasing feeling of uneasiness that settles over the audience. This is an incredible production, one that uses all elements at its disposal to their full extent. A truly unique theatre experience – and a play that also happens to be an absolute classic – this representation of denial as a tool to allow for love is accessible to all. A little piece of advice though – bring warm blankets to cuddle under!